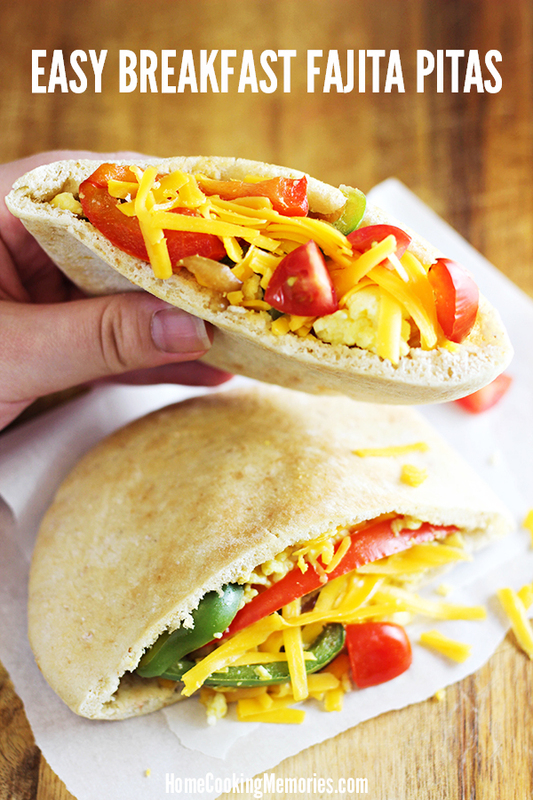 Easy Breakfast Fajita Pitas are an on-the-go breakfast idea that combines scrambled eggs with tex-mex flair! Add your favorite toppings to make it your own. To celebrate National Egg Month this year, I’m sharing a recipe that includes both eggs, but also my love of tex-mex food. 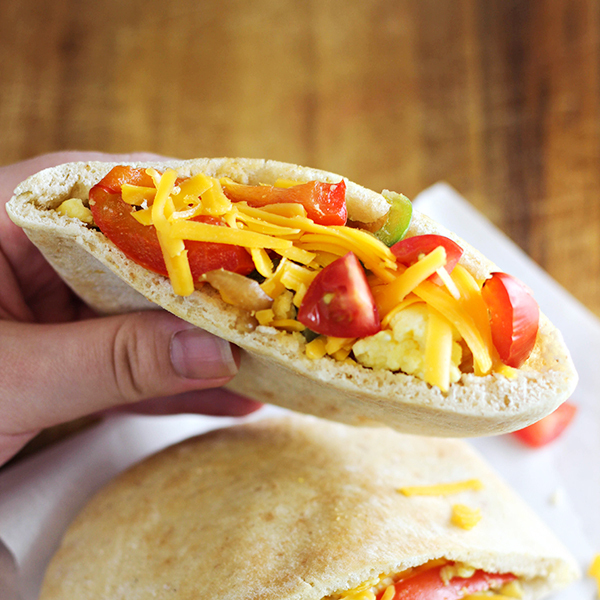 It’s sort of like a breakfast burrito, but instead, everything is stuffed into a handy pita bread, which is super convenient for taking breakfast-on-the-go. 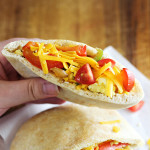 This breakfast idea came to me when thinking about a popular item on the Jack-in-the-Box fast food restaurant menu — their Chicken Fajita Pita. But rather than chicken, we’re using eggs and we’ve added in the bell peppers. 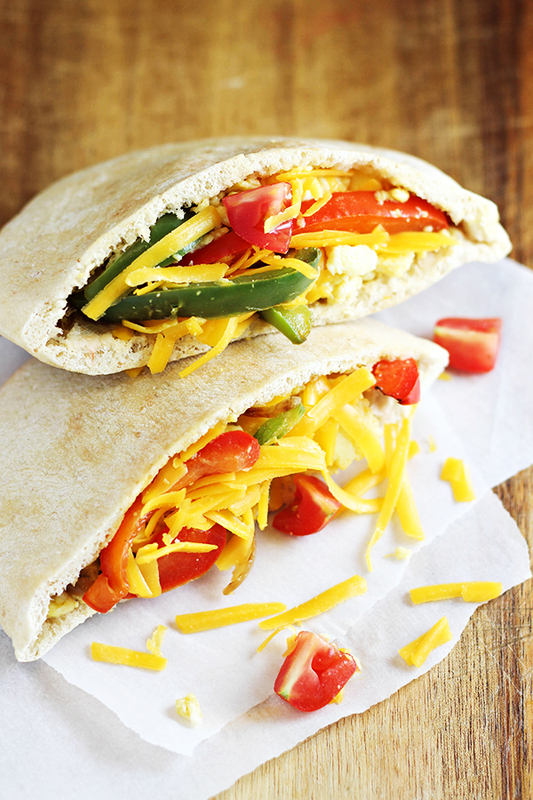 To make this Easy Breakfast Fajita Pitas recipe, you are going to first saute the bell peppers and onions until tender crisp. 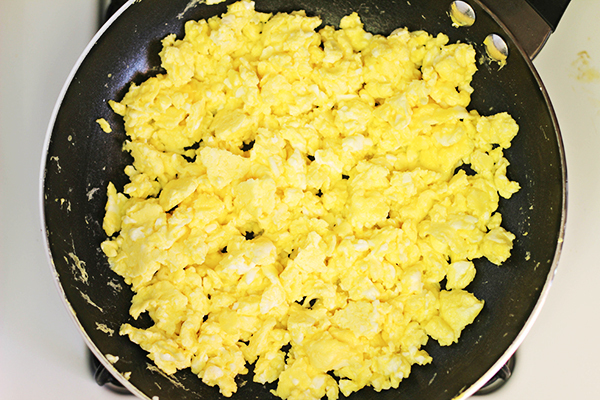 Seasoned scrambled eggs are also cooked. If you wish to wash only one pan, you could cook your peppers and then remove them from the pan and cook the eggs in that same pan. I actually cooked both at the same time, in two separate pans to save on time. After both the eggs and the veggies are cooked, they are combined together in the pan. Cut a pita bread in half and open one half to form a little pocket. Fill it with some of the egg and veggie fajita mixture and then you can top with any additional toppings. Just like with fajitas, you can top it with whatever you like. Some ideas are shredded or crumbled cheese, salsa, chopped tomatoes, sour cream, avocado, and cilantro. Here’s the complete recipe — if you aren’t ready for it yet, be sure to save it one of your Pinterest boards for safe-keeping. Heat olive oil in a nonstick frying pan over medium-high heat. 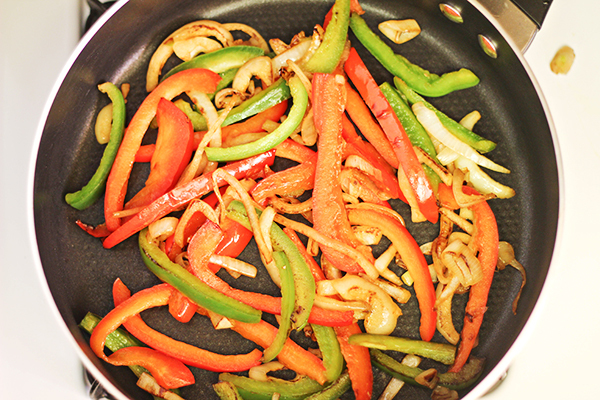 When oil and pan are hot, add peppers and onions and cook them until they are tender-crisp. Turn off heat and remove veggies from the pan to a bowl or plate so that the pan can be used to cook the eggs. In a bowl, beat together eggs and milk. Beat in chili powder and garlic powder. Melt butter in the nonstick frying pan over medium heat. When butter is melted and pan is hot, pour in egg mixture. As eggs start to cook, push, pull, and fold eggs with a spatula frequently until all egg is cooked and no liquid remains (but don’t overcook ). Turn off heat. Season with salt and pepper, if desired. 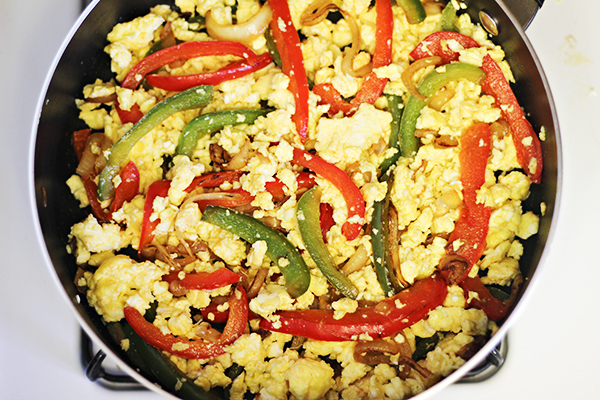 Add the cooked peppers and onions to the eggs, gently folding them together. Fill each pocket pita bread with desired amount of egg/veggie mixture. Top with optional toppings and enjoy! –The actual number of pitas you will get will vary on how large your eggs and bell peppers are. It also varies on how full you fill the pitas. We were able to get 5-6 pockets full, but it’s possible you could end up with as few as 4. This sounds delicious and looks very filling as well. This would be a great breakfast alternative for my kids. Thanks for sharing with us a Throwback Thursday! Pinned! Neat breakfast idea! Pinning! Thanks for sharing on Family Joy Blog Link-up. Please come back and join us again! Remember to leave your host a comment to increase the chance of being featured. Fabulous breakfast idea! Thanks for linking up with What’s Cookin’ Wednesday! Yum, these look delicious and good for you too! 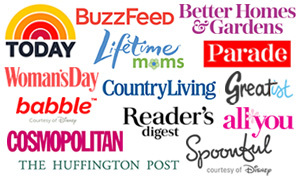 Sting hello from the best recipes & DIY projects link party! Mmm this looks so good. Im not really a fan of breakfast in general but this looks light enough that I would probably really enjoy it! This looks so delish and easy! I prefer my eggs scrembled with cheese. What a charming idea for breakfast! Glad I found this post before the giveaway was over. Very cute site! In a cheese omelet with bacon and home fries. I love them scrambled with chopped spinach, chives, feta and cheddar cheese, and a splash of half and half. My favorite way to enjoy eggs is scrambled. I love breakfast omelets!! Yum! We like breakfast burritos with eggs, lots of veggies, and salsa. Chorizo and eggs is my all time favorite. I love classic deviled eggs! I love a good omlette. I like to eat hard boiled eggs plain! Over easy mixed with homemade hash browns. I love frittata s. Thanks for the chance. I eat them fried with bacon slices in a toasted English muffin. My favorite way to eat eggs is in a quiche. I like my eggs over medium with a slice of toast! I like mine poached on toast. My gram would make this for me after school for my snack of course we called it dropped egg on toast. It is still a favorite snack of mine. mmmmm eggs! My favorite way to enjoy eggs is either fried in coconut oil/butter or soft boiled with the yolks still slightly gooey. I love omlettes with mushrooms. onions and peppers! My favorite way to enjoy egg is making deviled eggs! I don’t get to make them a lot but this weekend I am for memorial day weekend, so im excited. This looks delicious. I like my eggs scrambled with whatever i have in the fridge from veggies to cheese. I love my eggs fried and runny in country crock on toast. Scrambled with mushrooms, onion, and some spinach! I love a ham and cheese omelet! I love scrambled eggs wth lots of cheese over the top melted. Yum! I like them scrambled with mexican cheese and chopped onions. Frittatas with a bunch of veggies thrown in!